One day, as she was reading the daily newspaper, she saw a headline which caught her attention. “I have a O blood type! Someone out there needs my help!” She thought to herself. Without any further a do, she hopped right down to a nearest blood donation centre and donated her precious red blood cells, the fluid of life. Bloodbank@HSA Woodlands is located at Woodlands Civic Centre, Level 5. A lady in red greeted her and directed her to another personnel to check whether her veins were large enough for the insertion of the needle. Deenise was feeling a little nervous as she was afraid of needles,pain and the gory sight of blood but she gritted her teeth and tries to steer away the fears she had. She knew she musn’t be afraid of the tiny,shiny and prickly little things. ” Your left arm is more suitable for injecting the thick needle. Please proceed to fill up the forms at the counter.Next, you will have to see the doctor and he will advise you more about the procedure.” She gave the personnel a weak smile and do as told. The little Sticker Charm that nestled and stuck on the fibres of my cotton tee. She was brought into another enclosed room where one of the staff weave out a labaratory coat from the drawer and slips on a pair latex rubber gloves swiftly, like another other doctors would do in a surgical room. Almost ready to whip out a cutting tool to operate you. pricked my finger and a drop of blood oozes out. A blood donor must have a haemoglobin level of at least 12.5 g/dL in order to donate blood. ” Is it going to be painful?” Deenise asked herself repeatedly.She wouldn’t dare to ask the trained medical personnel because she knew they would not reveal the truth. Her heart trembled a little as she felt the tiny needle sinking into her dermis and the pain, which lasted for 6 seconds, diffused and spread into her neighbouring skin cells. “If only I had some gummy bears to munch my fears away…”, she thought,as she titled her head away, to refrain herself from looking at the needle. ” That’s it? You mean the needle went in already? But I didn’t feel anything.” She asked the person attending to her. She had a loud applause ringing inside her ears. It was as if a thousands of her tiny brain cells applauded for her. She chose a pink bandage with purple heart shapes which would brighten her up and perk her red blood cell count when she sees her favourite colour. She was showered with lots of “thank you” from the personnels as she walked into the lounge to grab a bite. 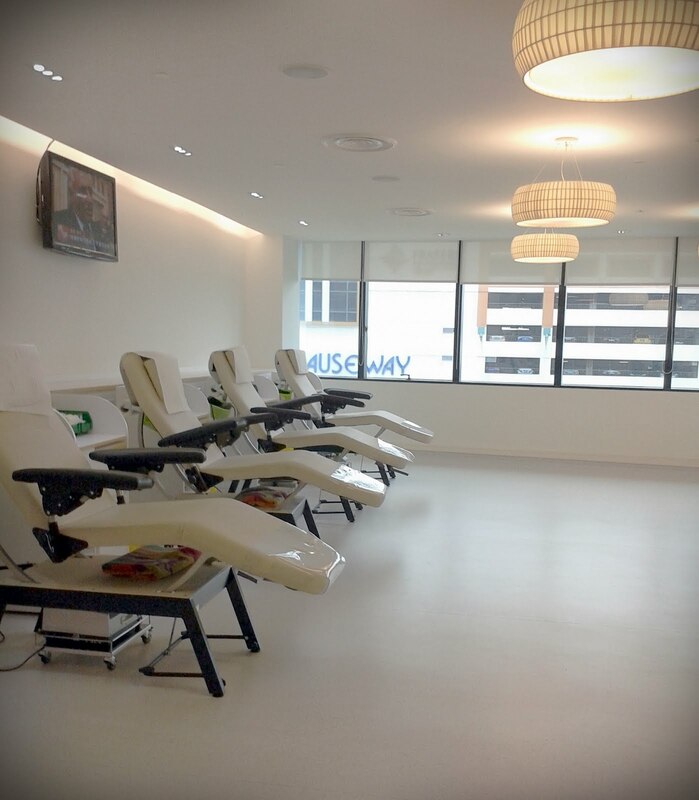 A brightly-lited lounge with comfortable seats for donors to grab a snack before resuming back to their busy lives. Sometimes I still find it hard to believe that a small machine like this could capture and sketch our beautiful memories. For everyone, their days seem to beautifully with a full-stop but for Deenise, her story just doesn’t ends here. Her life was filled with all sorts of punctuations where the full-stops were never the last for her life stories. An hour after leaving the bloodbank, she suddenly felt like her world was about to crumble. As she was floating through the crumble, she tried hard to stay conscious but just she stepped onto the train platform, her vision blurred and went … blank. She grabbed onto the handrails as if her whole life depended on it while she was drawn into darkness. ” Are you okay? What happened?” A voice overflowing with kindness. She lifted herself up as the two ladies pulled her up and brought her to a stone bench. ” Angels.How can anyone who knew nothing about me actually came forward and treated me like their own child?” She lied on the bench, regaining her vision as the mother of the little girl brushed her hair away to wipe off the beads of perspiration. Deenise just wished she could get home at that very instant but her skin was pale and cold. “It all seems too familiar.There must be a couple of passer-bys who gave me looks of pity but they just shrugged and stared as they left, with me out of sight,” she thought,” just like how I by-passed a couple of inccidents and convince myself how I wouldn’t be able to help them. ” Why Jiejie’s hand is so cold?” Her vision regained and she tried to look into the young toddler in her pretty frocks,wanting to tell her that everything’s fine. ” Miss, are you alright? I’ll get you a wheelchair and you can take a rest in our staff office.” A lady clad in SMRT uniform spoke to her. As she sailed across the MRT platform in a wheelchair, her thoughts were wheeled into another realm where she felt this urge to reciprocate kindness where it will make the world a little brighter than before. Yes, that is all she needs to warm up her soul.